BRYAN EATON/Staff photo. 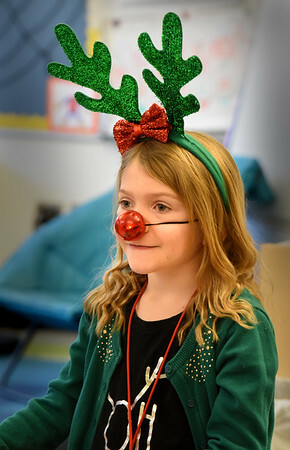 Gemma Shakespeare, 8, wears antlers and a red-glowing nose like Rudolph the Red-Nosed-Reindeer in Arna Beaudoin's class at the Bresnahan School in Newburyport on Monday. They're celebrating Holiday Spirit Week with Monday as Merry Monday, and today is Snow Much Fun Tuesday and so on.